Go to the Members' page to find out about a 20% discount at Port Chantereyne. 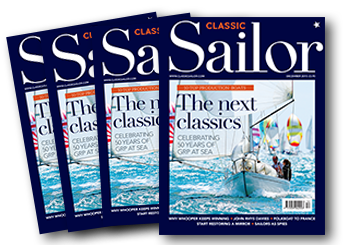 Members' Classic Sailor Subscription offer saving £5 for a 12 months subscription. What is a NIC 32 ? "A short History of Camper and Nicholsons 1782 - 2005"
"History of the Nicholson 32"
Classic Sailor, October 2015, p16, "C&N 32"
#518 February 2010, pp.28-31, "The 10 best 32-footers"
"...if you want a sturdy, all weather cruiser of impeccable pedigree with hundreds and thousand of sea miles under her keel, you need look no further. ...some have suggested that she'd be a better introduction to cruising than the skittish charter boats on which an increasing number of potential owners experience their first taste of sailing anything bigger than a dinghy. ..on a passage - especially given a fistful of breeze - you should be able to record some respectable daily averages. Even if you don't fall for the Nic's styling - and I reckon she's rather dashing from most angles - there's certainly no denying her strengths." #427 July 2002, pp.104-110, "Worth her weight ?" -...the Nic's behaviour under power astern can only be descibed as beyond redemption...kicked heavily to starboard... No amount of coaxing could persuade her even to think about going the other way. -...a Nic 32 means living with sluggish performance in light airs. ...and less accomodation than on a modern equivalent. "Boats of the month": Have a look at The Album! Copyright © 1998-2015 Nicholson 32 Association.